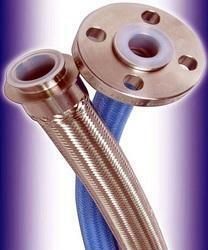 Providing you the best range of ptfe flexible hose with effective & timely delivery. We are one of the reputed manufacturer and supplier for providing the best quality of PTFE Flexible Hose in the national market. These are manufactured using highly flexible raw material that is procured from reliable vendors. The hoses available with us are mainly used for pipe fittings Our flexible hoses are resistant from all kinds of harsh treatment during their usage. Moreover, our esteemed customers can avail these flexible hoses from us at industry-leading prices within the stipulated time-frame. Ptfe sintered resin smooth bore tube. The low thickness assures medium permeability values. PTFE flexible hoses are capable of resisting low and high. Generally unaffected by all chemicals (except melted alkaline metals) so used in laundry, rubber, chemical refrigeration industries. This is convoluted PTFE tube lined hose. An outer stainless steel wire (SS-304) braid reinforcement. Generally unaffected by all chemicals (except melted alkaline metals) so used in laundry, rubber, chemical refrigeration industries and for vacuum. Maximum utilization of steam pressure 250 PSI.